My husband and I have made many trips to Prince Edward Island, and while we are there, we always indulge in oysters. We haven’t been able to travel to the PEI in a few years, so I was inspired to bring some of our favourites into our home. Even though I’m a vegetarian, seafood is one of those things that I will never give up entirely. When I do treat myself to seafood, I make sure it is fresh and I really go out of my way to make it delicious. These BBQ grilled oysters are amazing! Pre-heat BBQ on medium-high heat. Arrange oysters on BBQ safe baking sheet. 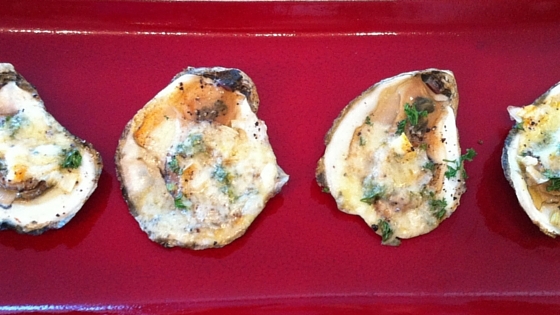 Top each oyster with a pinch of the minced garlic, Tabasco sauce to taste, a few onions and top with shredded cheese. Place on BBQ, close the cover and cook for 10 minutes, or until cheese has melted. Remove the oysters from the BBQ, add to serving plate and drizzle with lemon juice.